Greetings, Traveler, and welcome to HollowWorld! 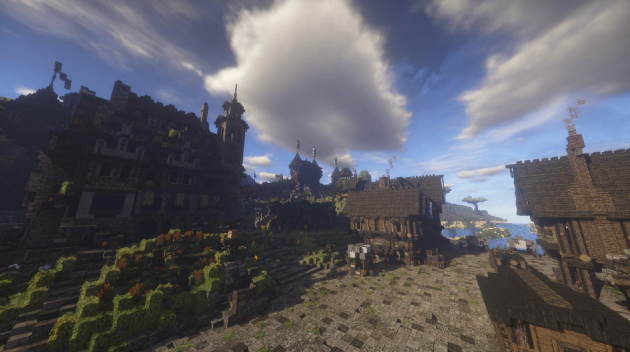 We are a Minecraft Roleplay community with a Medieval Fantasy theme. We have a diverse range of races and locations that makes HollowWorld a great place for an immersive roleplay experience with a character of your own design. There are some conditions, and we would like for all applicants to be in the right spirit. Co-operation and generosity go a long way and we hope that by working together you will enjoy your time with us and make new friends on your journey through HollowWorld. As with any other server, inappropriate conduct could result in sanction or your account being banned from HollowWorld. We encourage all players to be respectful of one another and try to respect the atmosphere our server is trying to achieve. On the whole, I hope that you will be respectful of the staff who help manage our community. They cannot materialize blocks on a whim or teleport you across the map. We want to make this experience feel as real as it can and should players disregard these terms it can make things uncomfortable for the other players. For further information on server rules and conduct please consult our Codes of Conduct and our King's Law. To learn more about the world itself and the playable races, take a look our Official Lore forums. To learn more about the features of our server, browse our Player Guides, or speak to one of our Mentors. Once you login to the server- Check out our Starter Guide! Once you've read and familiarized yourself with our community standards and lore, we encourage everyone to apply using the application format below. While you wait for your application to be reviewed, feel free to explore the world. As an unwhitelisted player, you are still able to log in and look around, but will not be able to interact or chat. Additionally, while you wait for your application to be reviewed, we ask that you not message Staff members to hurry your application along. Doing so may result in your application being declined for impatience. With all that in mind, we here at HollowWorld look forward to reviewing your application. Happy exploration! To begin your application, create a thread in the Whitelisting forum with the title: [Your name]'s Application. Do not post it in the Approved Applications and we ask that you wait until your application is approved before making a Character Profile. In the application itself, please copy and paste the form below. It involves a set of questions about you, questions about your character and a 400 word minimum test at the end. Fill out the questions honestly and thoroughly. The Staff that reviews your application may ask you to edit if your character, answers, and/or test do not meet requirements. The application may also be declined if too many issues are found and you may be asked to reapply. Once you are accepted, however, HollowWorld is yours to explore. Just type /warp whitelist in-game to begin your adventure! Note: When you make the application, be sure to keep it properly formatted. You can remove the italicized text when you copy and paste it, but leave the questions formatted so the Staff can properly tell which part you're answering. Under the minimum age or displays an attitude that does not fit with the mature community we advertise. Important questions/parts of the application were missing. Written portions shows evidence of struggling with English. Characters don't fit within the guidelines/unoriginal. Every time a Staff sees an orphan assassin that swore revenge for the brutal murder of their parents, we cry a little each time. Same goes for lone survivors of disasters, ship wrecks. The entire world cannot be populated by orphan assassins and lone survivors of tragic backstories. Sometimes applications are declined if a staff member requests edits to be made, but the player doesn't reply. They're declined for inactivity if the edits aren't made within two-three weeks. How do I get started once I'm Whitelisted? There's a set of tutorial quests to help you get familiar with the world. After you complete them, it's up to you! HollowWorld uses freeform RP, so where you go from there is up to you. If you're interested in joining a town, check out our Settlements forum to see towns that are open and active. What can I do while I wait for my application to be reviewed? You can actually explore our world without being Whitelisted! You can walk around the map, but you can't interact or use the chat until your application is approved. All we ask is that you're patient. If you contact staff to try and hurry your application along, you may get declined.